Vocally -Combo - Voice Activated Phone Dialer - There is no need to remember and dial the same numbers again and again. Just pick up the phone, say the name of the person you wish to call, and let Vocally do the rest. 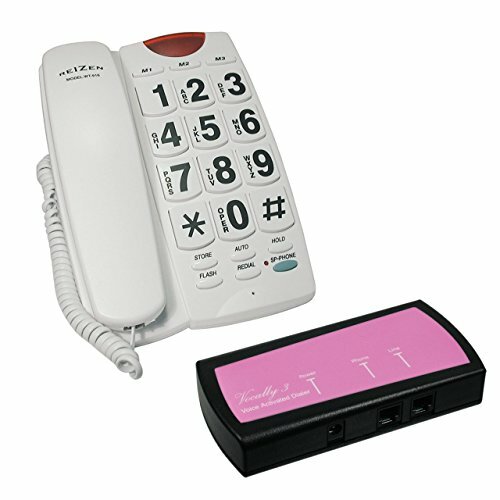 This voice-activated phone easily connects to any phone and enables voice dialing. Once the machine learns your voice, your voice-activated phone will be able to remember and dial up to 60 names and phone numbers. Each voice activated phone can store a number up to 19 digits long. Very simple to use. You are always guided by a clear voice that helps you add, delete or hear a name using its interactive voice menu. Does not interfere with regular line and phone use. Very fast dialing with no mistakes; works with any phone. Recognizes any language, tone and accent. Stored names playback. Small size and elegant.